Hopes For Palestinian State Fade As Israeli Settlements Expand In West Bank In one of his last campaign moves, Prime Minister Benjamin Netanyahu made a far-right pledge: If re-elected, he would annex Jewish settlements in the occupied West Bank. 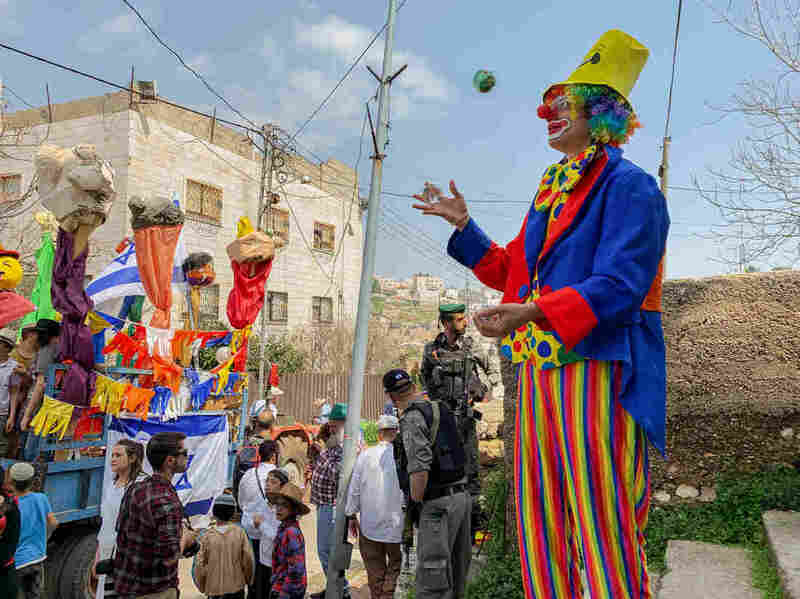 Israeli settlers celebrate the Jewish Purim holiday on al-Shuhada Street in the divided West Bank town of Hebron on March 21. Even if it is an election tactic to energize his nationalist base, Netanyahu's annexation pledge is a fitting final chord to a decade of his administration, which began with a reluctant embrace of a two-state solution to the Israeli-Palestinian conflict and ended with the chances of such an outcome dwindling to a new low point. In one of the West Bank's tensest cities — where several hundred Israeli settlers live in guarded enclaves among some 200,000 Palestinians — Israelis dressed up in costume and paraded down the main street. It was the Jewish carnival holiday of Purim, but the settlers were celebrating more than just the religious festivities. In January, they had successfully lobbied Netanyahu to expel an international observer group tasked with patrolling Hebron and making Palestinians in the city feel safe after an Israeli settler killed 29 Palestinian worshippers there on Purim in 1994. Chicago native and Hebron settler Yisrael Zeev is in costume as a pipe-smoking farmer and driving a float in the Purim parade. A red swath from the uniform of an international observer from the recently expelled Temporary International Presence in Hebron flutters on a pole. "We will not allow the continuation of an international force that acts against us," Netanyahu said in a statement about the Temporary International Presence in Hebron. Settlers had accused the organization of causing friction and undermining Israeli rule in the city. But member countries of the group criticized the closure of the mission, saying the observers promoted "conflict resolution between Israelis and Palestinians" and helped prevent violence. "Apparently they were very temporary, and we are the permanent Israeli presence in Hevron," said Yisrael Zeev, an Israeli settler in the city, calling the city by its Hebrew name. Dressed as an American farmer, Zeev drove a float in the parade, with a swath of an observer's uniform flapping from a pole like the flag of a vanquished enemy. Some settlers, including a candidate in the national elections, dressed in costume as the expelled international observers. 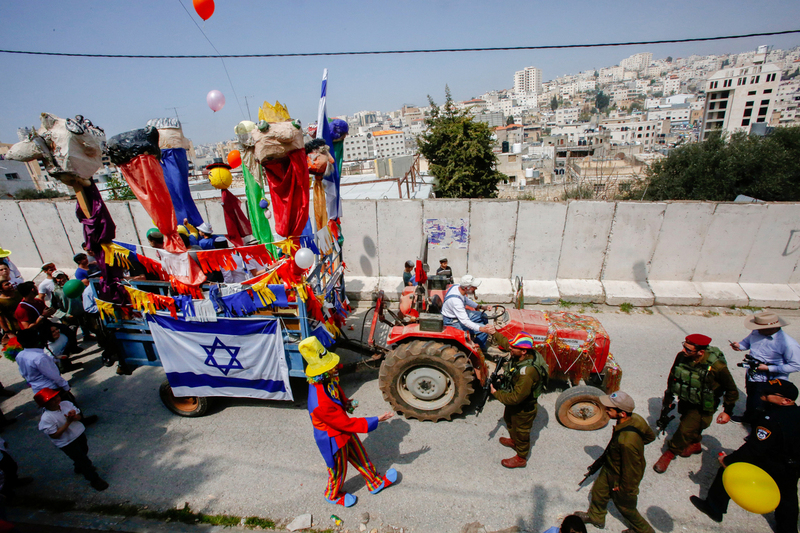 Israeli settlers celebrate Purim on al-Shuhada Street in the divided West Bank town of Hebron. "Everything's going in the right direction," Zeev said. Israel captured the West Bank in 1967 and has occupied it ever since. Both Israelis and Palestinians have historical ties there. In 2009, a few months after entering office, Netanyahu gave a speech that has become famous: For the first time, he publicly called for the creation of a Palestinian state. He was facing pressure from then-President Obama, who advocated for a Palestinian state alongside Israel: a two-state solution to the Israeli-Palestinian conflict. But it didn't stop Netanyahu from enlarging Jewish settlements in the occupied land. Apart from a 10-month settlement construction freeze at Obama's request, Netanyahu's government has continued to build homes for Israelis in the West Bank, leaving the map of what could be left for a Palestinian state looking like Swiss cheese. 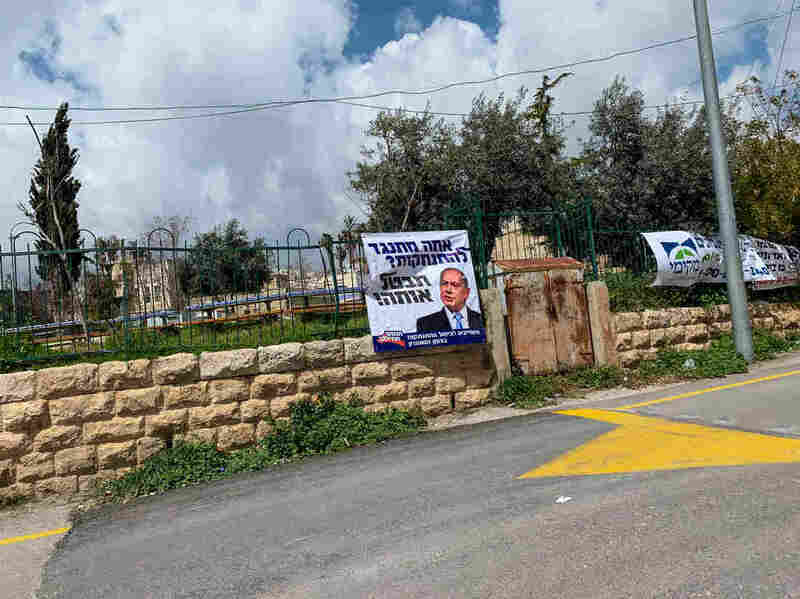 In Hebron, Israeli Prime Minister Benjamin Netanyahu is depicted in a poster calling on him to restore Jewish settlements in the northern West Bank that were uprooted by a former prime minister in 2005. About three-quarters of the construction has taken place in settlements deep in the West Bank "that Israel will probably need to evict in the framework of a two-state agreement," said Hagit Ofran of Peace Now, a settlement watchdog group that examines aerial photos to count each settlement unit built. The homes range from spacious U.S. suburban-style homes to multifamily structures to trailers set up on a hill. "Every year they build at least 2,000 units, which means thousands of new settlers every year in the West Bank," Ofran said. "If we want to have peace, specifically where Netanyahu is building is in places that will be harder to compromise." The phenomenon of completely new settlements, which Israel previously stopped, was renewed during Netanyahu's tenure. Settlers built a few dozen small outposts without government permission but with Israel largely turning a blind eye, Ofran said. "The evolution isn't just that [Netanyahu has] gone more to the right. It's that the entire country has gone more to the right, because the Palestinians have killed a lot of their support in Israel," said Israeli political analyst Reuven Hazan. Most of the Israeli public doesn't believe a peace deal is possible now, he said, with instability in the Middle East and a fractured Palestinian leadership divided between the militant Hamas in Gaza and a weakened Palestinian Authority in the West Bank. "The prospects of a peace partner or a viable peace process is not something that you can sell to the man or woman on the street, nor can you win an election on today," Hazan said. In the run-up to Tuesday's elections, two dozen senior government ministers and lawmakers released video statements endorsing a policy once considered fringe. Instead of negotiating with Palestinians about the West Bank, they're calling for Israel to unilaterally annex parts of it. Netanyahu resisted that move for years. But last month, following Trump's backing of Israel's annexation of land it captured from Syria in 1967, Netanyahu argued that Israel has the right to keep land it seized in war. In a TV interview on Saturday, just days before the elections, he pledged to "impose Israeli sovereignty" over Jewish settlements, including isolated ones deep in the West Bank, if re-elected. In a weekend meeting with settler leaders, Netanyahu said he would do so "immediately" after the vote, said settler leader Yossi Dagan. The U.S. Embassy in Jerusalem declined to comment. 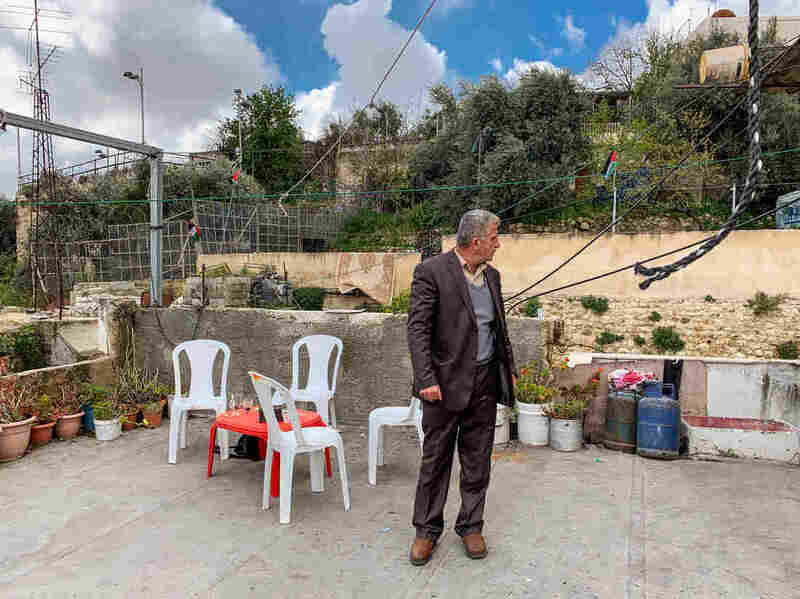 There have been reports of settler harassment of Palestinians, as well as a recent wave of Palestinian stabbings against soldiers in the city. Sharabati says he must show Israeli soldiers his assigned number, 711, written in Sharpie on his ID cover, to enter the enclave he lives in alongside Israeli settlers. He is part of a civil society campaign called Dismantle the Ghetto. 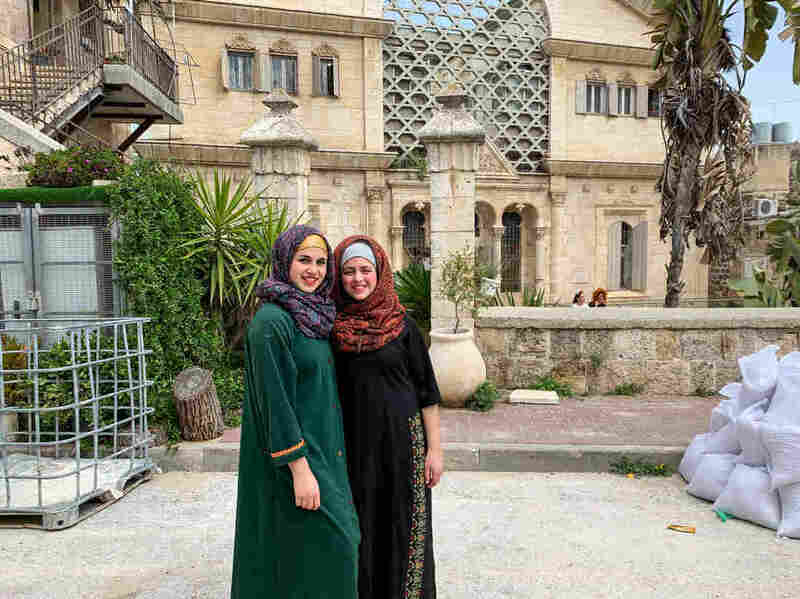 Israelis dressed up in costume as Palestinian Muslim women for Purim in Hebron. 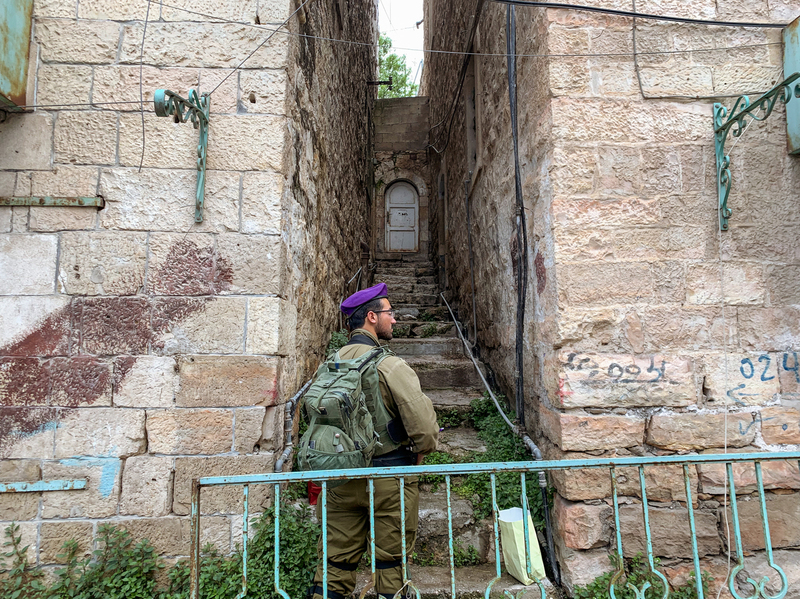 Jewish settlers in Hebron say it is important they live in the city, because of its biblical history — as the traditional site of the tomb of Abraham and other ancestors — and because it was home to an old Jewish community that ended when Arabs killed some 69 Hebron Jews in 1929. "There is nothing extreme about Hebron," said Yehuda Shaul of Breaking the Silence, a left-wing Israeli veterans group shunned by Netanyahu's government for its work collecting unflattering testimonies from soldiers about their service in the Israeli-occupied West Bank. "Restrictions of movement — do you have only in Hebron? All over the West Bank. Settler violence in Hebron? You have all over the West Bank. Military presence only in Hebron? All over the West Bank." The Palestinian-only part of Hebron is accessible from the settler area through a military checkpoint. Palestinian politics professor Assad Aweiwei stands on the Palestinian side. He's not allowed to cross through. "This is apartheid politics," he said. "We must change the condition. We must be equal in this land. We can live together." Palestinian President Mahmoud Abbas failed to deliver on his promise of an independent Palestinian state, and a growing number of Palestinians — including Aweiwei — advocate one shared state with Israelis. Aweiwei says Palestinians would likely become the majority, like how apartheid South Africa became a black-majority democracy. In the past decade under Netanyahu, Israel has approved more settlement housing in Hebron and has invested in tourism, archaeology and educational tours to normalize the tense city for average Israelis, who tend to avoid it. 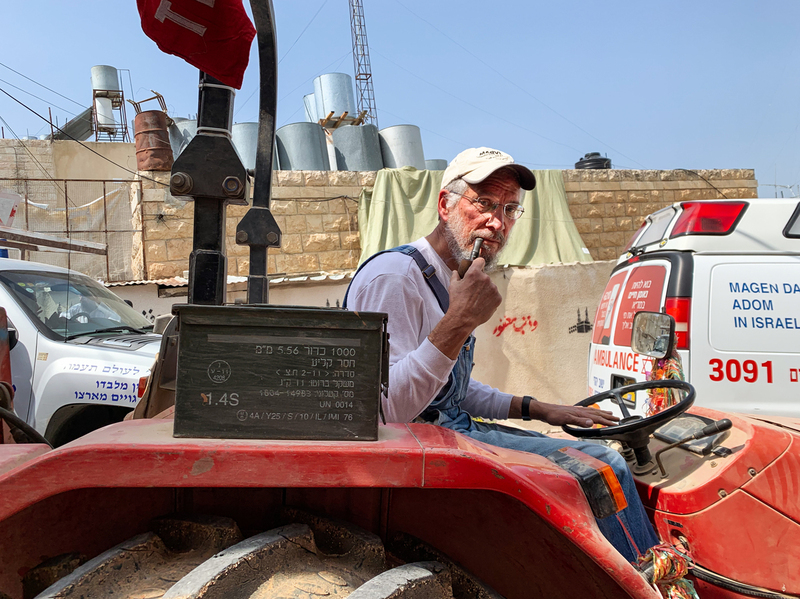 In the past decade under Netanyahu, Israel has approved more settlement housing in Hebron and has invested in tourism, archaeology and educational tours to normalize the tense city for average Israelis, who tend to avoid it — Israelis like Ophir Solonikov. In late March, he visited Hebron for the first time on his 50 birthday and on Purim. He's not a Netanyahu voter, not a settler and not religious. But he sees the West Bank city — where Jewish and Muslim traditions say Abraham is buried — as a part of Israel. "I dunno," Solonikov said as holiday music blared. "If you do it in goodwill, it's a good idea."